These posts are for special events that fall outside the traditional Latow "Groups". 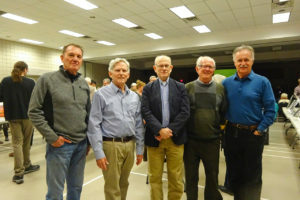 The 2019 Three Club "Photographic Exhibition of Projected Images and Prints" was a great success at the Burlington Seniors' Centre on March 9 with 170 members and family in attendance. 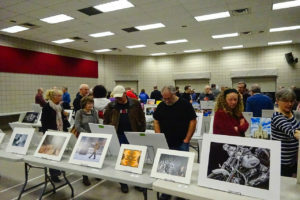 Together, the Hamilton Camera Club, Latow Photographers Guild, and Trillium Photographic Club shared about 150 matted prints for the enjoyment of the attendees. Each club's 17 minute A/V show displayed additional images placed to music. Latow AV show was created by Jay Trout, click here to see the video or upload it to your device for further enjoyment. Coffee, tea, soft drinks, water and dessert items were provided. Details and forms are included in the attachments to the November 2017 In Focus email. For full information, please view the documents under the Christmas Sale section of the Latow website Member’s Download Area. To add to your photo experience and trials, NJ, our Latow Studio Coordinator has arranged for a model who will be available for shoots outdoors weather permitting (and indoors in the Studio if weather turns bad). 7:00 p.m. Meeting starts at in the Rotary room. $10 per person admission. Cash bar. Cheese, crackers, veggies, and fruit trays will be served. Mix and mingle. 7:50 p.m. Adjourn to the studio for the awards ceremony. 8:50 p.m. Return to the Rotary room. Coffee, tea, cash bar, dessert trays served. Celebrate the victors; commiserate with most of us. This is a social event. Members are encouraged to bring a friend or significant other to celebrate the best Latow images of the year. Want to exhibit your prize images? Have an opportunity to both showcase and sell your work framed and unframed? Then don’t miss out on participating in Kaleidoscope of the Arts, a creative art show and sale, one of Arts Burlington’s premiere events, being held in the Art Gallery of Burlington (AGB) April 22, 23 and 24. Works from members of AGB’s seven Guilds will be on exhibition, showcasing many one-of-a-kind pieces. Open to the public, we have the unique opportunity to not only exhibit our works but sell them as well. Members are invited to participate in AGB’s and Arts Burlington’s Opening Ceremonies on Friday April 22nd from 5 to 7 p.m. Kaleidoscope studios and galleries will be open to those people attending the opening ceremonies prior to and during the Opening Ceremonies from 4:00 pm to 7:30 pm.  The Lakeshore/Rotary Room shared with other guilds for exhibiting a portion of our members framed photography.  The Perry Gallery for framed photography.  The Latow studio for framed photography on easels – this is a separate initiative by Latow open at the same time as Kaleidescope.  The Children’s Studio for unframed photography.  The Latow darkroom for the children’s hands-on Program - do it yourself photograms.  Unframed photography: Thursday, April 21 from 6 to 9 p.m. in the Children's Studio.The displays and setup should be completed that evening! Please note if you are going to participate in the Unframed Photography Studio you should register with Joanna Muckle to ensure space requirements, as well as equipment needs are noted with the Kaleidoscope Committee.  Latow Dark Room (for the Latow Children’s Hands On Activities): Thursday, April 21 from 6 to 9 p.m. Setup, with the exception of chemicals, should be completed that evening.  Latow Photography Studio: setup will take place Thursday, April 21 from 4 to 8 p.m. Setup should be completed that evening. This area is for all Latow members who want to sell their photographs. They must be framed or on canvas and suitable for hanging. The AGB will provide some easels for displaying prints. Extra easels will be available from Studio 3 at Fred Oliver's home (only 5 minutes from the AGB). Anyone using those easels must arrange ahead of time at gjones76@cogeco.ca to pick them up and return them after the show. Each member can submit up to 3 prints. There is no entry fee. Ensure that you have a label with your name, the print title and sale price for each piece that you are submitting. Please note that the prints in this room will not be part of Kaleidoscope 2016 Juried Show. 2016 Latow/Kaleidoscope Juried Show: Will be judged on Friday April 22.  Elegibility: All those submitting art work must be a paid member of both the AGB and Latow for 5 months prior to the submission date.  Submissions per photographer: 1 framed print, canvas or metal suitable for hanging.  Fee: The submission fee is $10 and/or $10 per table in the unframed photography.  Hanging requirements: All prints must be suitable for hanging.  Commission: The commission on sale of your work will be 15% of your sale price. The Commission will go to Arts Burlington.  Required volunteer hours: Submitting members have to complete or have committed to 10 hours of volunteer time to our Guild to be eligible to enter this show.  Pickup: All prints and artwork can be picked up between 5:00 – 5:30 pm Sunday April 24th or have someone do so on your behalf. Please note: There are new standards for the display of art work at shows & sales at AGB. Please refer to the New Standards as attached to the March 17 eblast from our President. Do you do your own printing, or wonder about the tools and techniques of those who do? On Thursday, May 19, we'll focus on what the home printer can do in a show-and-tell session that needs your input. We will examine prints made from a standard image, using different printers and different papers. We'll also have fine-art prints of the maker's choosing, with and informal Q&A session on how they were made. Lots of variety will make this an informative and fun evening. If you would like to participate or just have questions, contact Tom Stephens at a meeting or by email. Members are invited to enter up to three framed pieces to be hung In the Lee Chin Gallery. Entry fee $10.00. Members are also invited to enter unframed prints for sale in the Unframed Room. Small framed pieces no larger than 80 square inches can also be sold in the unframed room. If you wish to book a table to display your unframed prints please contact Virginia. Entry fee $10.00 per table. You can find Virginia’s contact information in the November newsletter either in the Christmas Sale Article or under The Group and Activity Coordinators. If you are unable to setup your table on Wednesday evening please advise Virginia and leave your artwork in the cutting room. Between Virginia and other helpers we will get your table setup for you. There are a limited number of tables so please contact Virginia to book a table as soon as you can. What is the Exposure Triangle? How do I control Depth of Field? Is there life after the AUTO setting? Do you have these questions? Do you want to better use your camera to improve your photography? All this and more will be discussed at the upcoming Latow Photographers Guild Basic Camera Workshops for members getting into photography. There will be two workshops - the first on a Thursday night and the second on a Saturday morning. The First Workshop will be a very basic overview of Photography with an opportunity to discuss cameras and some simple shooting skills. No need to bring your camera to this Workshop, just a note pad and pencil. The first (in class) Workshop at the AGB Studio is scheduled for Thursday, February 18, 2016 from 6:30 PM to 9:30 PM. The Second Workshop will be "Hands On". An opportunity to bring your camera equipment and shoot as a group at two different locations in the Burlington area, applying what we learned in the first workshop. The second "Hands On Workshop" is scheduled for Saturday, February 27, 2016, 9:00 AM, finishing at noon. The locations for the Hands On Workshop will be announced closer to the date.